Whats up with that New York? How can this disgusting smoke be considered even reasonable for people to be breathing. Is this really the way you want to run your city? 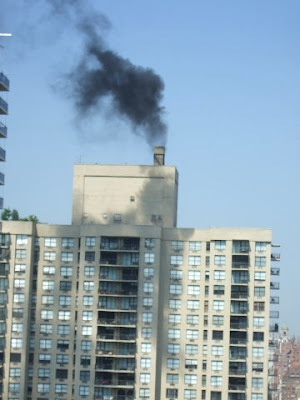 BTW I had a few people email me this morning, no this apartment incinerator near my building doesn't spew smoke like this all the time - it just does this about once a day for about 30 seconds...personally I still think this is too much pollution or detritus to be spewing into the environment.